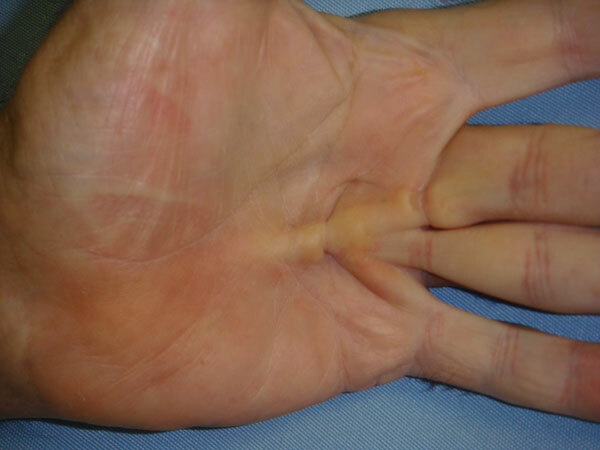 Dupuytren’s contracture is a hand deformity caused by the gradual shortening and thickening of the tissues in the palm of the hand known as palmar fascia. 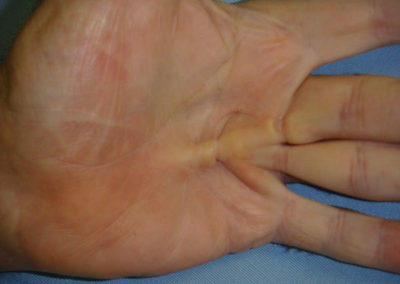 This causes the tendons of one or more fingers (usually the ring finger) to become increasingly difficult to extend, resulting in a perpetual partially flexed finger. The thickening of the palmar fascia and contractures continues to worsen despite the initial pain fading away. Ultimately the contracture condenses into the iconic “cord” adjacent to or more superficial than the actual tendon. The contracture develops much less frequently in women than in men and occurs frequently after the age of 40. The underlying biological causes of Dupuytren’s contracture is currently not fully understood. It has been observed to be more prevalent in persons with diabetes mellitus, epilepsy, alcoholism, smoking, vascular disorders, and AIDS. Genetic predisposition to Dupuytren’s contracture has been supported by statistical analysis and it is currently believed that individuals with a close family member suffering from the disease have between a 60-70% chance of developing it themselves. Treatment for Dupuytren’s is not always advised due to the relatively benign symptoms. In some cases, the condition may plateau by itself and not change. The traditional treatment for many years has been excision of the problem tissue (palmar fasciectomy). Other treatments include percutaneous needle fasciotomy, segmental fasciotomy, and collagenose enzyme injection. Each of these has unique risks and benefits. 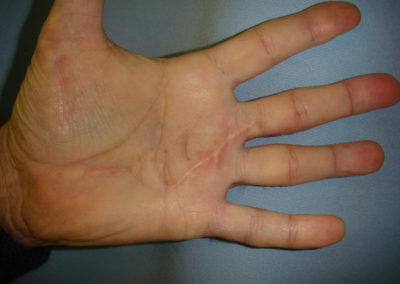 Recurrence of the contracting bands may develop after any treatment modality but are lowest after dermatofascietomy. This is where the band and overlying skin are excised and a full thickness skin graft is placed in the defect. Night splinting only is often used for 4 to 6 weeks after surgery. Read more about Dupuytren’s Contractures HERE.